With no added ingredients, popcorn is a low-calorie food that's high in volume to fill you up without compromising your diet. The calorie count rises, however, when oils and butter flavorings are added, as with standard microwave popcorn. While eating a whole bag of regular microwave popcorn can provide as many calories as a small meal, choosing "light" versions can help keep the calorie tally in a more reasonable snacking range. Standard microwave popcorn contains added fats and provides 165 calories per ounce to total 413 calories per 2.5-ounce bag. 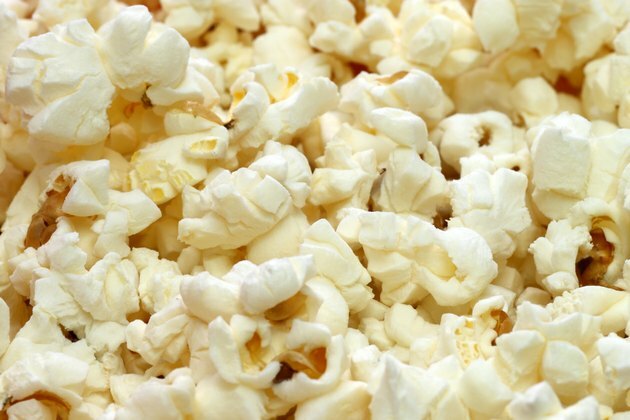 In comparison, plain, air-popped popcorn contains just 108 calories per ounce, or 270 calories per 2.5 ounces. If you prefer convenience, hope lies in low-fat microwave popcorn, which usually contains 120 calories per ounce, or 300 calories per bag. To further reduce calories, have just half a bag or purchase single-serving popcorn bags, which often contain just 100 calories each. To see what those 413 calories in your popcorn bag truly represent, consider that 1 pound of body fat contains about 3,500 calories. You gain weight by eating more calories than you burn, so consuming a bag of regular microwave popcorn each day on top of your normal weight-maintenance diet would make you gain 1 pound after eight or nine days. How Many Calories Are in a Potato Chip?